« Shaking Up the City Council? The NELA to CicLAvia posse from CicLAvia South LA. Yes! Yes! Yes! CicLAvia is coming to Pasadena! We are hosting a feeder ride from NELA to CicLAvia Pasadena from the Flying Pigeon bike shop on Sunday, May 31, 2015. 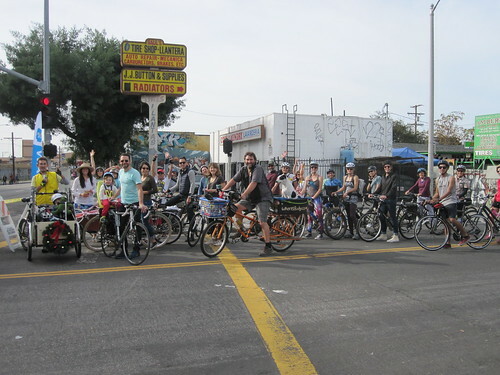 Ride departs at 9 a.m. Meet at our shop (located at 3404 N. Figueroa St., Los Angeles, CA 90065) and join a large group of neighbors on a peaceful and safe ride from NELA to the Old Town Pasadena start point for CicLAvia. Plan to arrive in Old Town Pasadena around 11 a.m. The shop will be open for about 30 minutes before we depart for Pasadena at 9 a.m. We’ll be able to inflate tires, do quick bike inspections, sell locks, helmets, water bottles, etc.